Happy Monday Friends! I hope you all had an amazing weekend. We celebrated my cousin's wedding and enjoyed a little family adventure out of town. It was fun to getaway for the weekend and spend time with family. 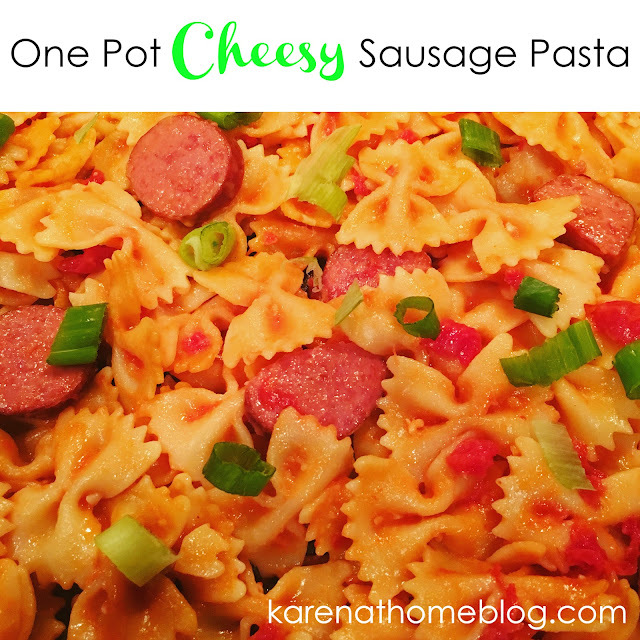 Last week, I posted a few pictures and stories on Instagram while cooking this delicious meal...one pot cheesy sausage pasta. As promised, I wanted to share the full recipe with all of you. I absolutely love that this meal can literally be made in one pot...so easy. I hope your family enjoys it as much as mine! Add olive oil to a 4-5 quart saute pan over medium high heat. Add chopped onions and sliced sausage and cook until lightly browned. Add garlic and stir for about 30 seconds. Add chicken broth, tomatoes, milk, pasta, and seasonings. Bring the mixture to a boil, cover, and reduce heat to low. Simmer for about 15 minutes, or until pasta is tender. Turn off the heat and stir in 1 cup of cheese. Sprinkle remaining cheese on top and cover for about five minutes to allow cheese to melt. Top with sliced scallions and serve. Easily serves a family of 4.